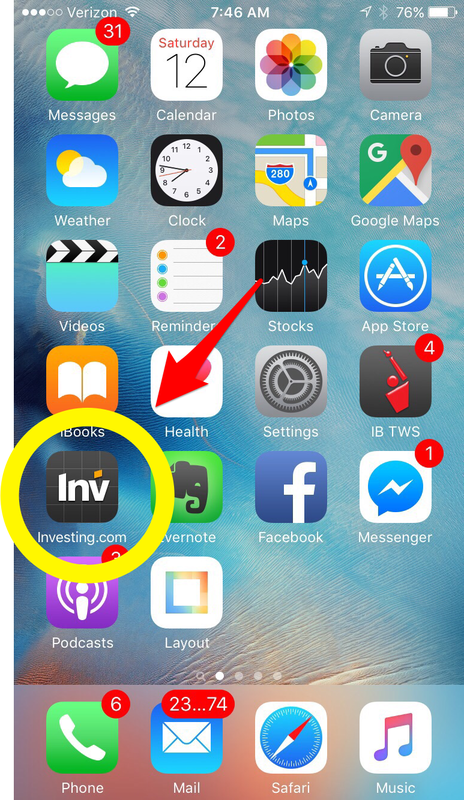 Download the investing.com app (free, iOS) – type in “SPY” in the search at the top right – then select S&P500. 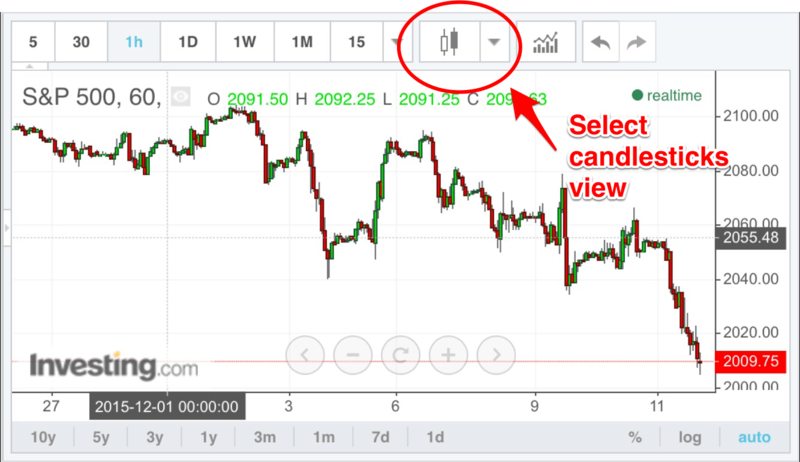 Rotate your phone and make sure the candle stick chart is selected at the top. –and wow – what a big day in the markets. The S&P closed down 1.94% today and we actually just realized $2,500 in profits from our high-probability bet last Friday just 7 days ago –turning $7,500 to $10,000 in just 7 days. On a smaller scale, you can think of it as turning $750 to $1,000 in same period for time. And actually, if the markets didn’t do anything today – just stayed where it was — or even gone up — we still would’ve realized the $2,500 — that’s the beauty of our strategy. We also initiated a new trade yesterday buying puts that we sent out to our members and that one is already up more than $2,000 today. Now you might be wondering how this podcast is different from other podcasts — well, here we take mobile-focused way of making real money in the markets. Yes, we these are our real trades with real money. — and each day we post an update on our blog over a lifestyletrading101.com/blog –so everything is documented. we only do 1 trade a week. What do I mean by being mobile-focused? Well, we do everything right from our mobile phones and we show you how you can, too. We don’t do hundreds of trades per week like some traders do — that would require us to constantly go in and out. We don’t have time for that, and frankly, neither do you. The lifestyle trader approach is about living the lifestyle you want and doesn’t require you to sit in front of a computer screen watching every tick. So our mobile-focused approach teaches you how to do just 1 trade each week. We give you high probability trades so you can go on with the rest of your life and check in here and there. We can’t promise every trade will be a winner, but we generally only share what we believe have at least an 80% chance of success. Each week we place just 1 high probability trade at LifeStyleTrading101.com — and we talk about it right here in this podcast–along with any forecasts we might have for where the market is going. So that’s a bit about what makes this podcast unique—real money, real trades — right on your phone. Now, onto this week’s update – we just realized profits of $2,500 and we sent text alerts out to our members for trades going into next week. First – the $2,500. How did I make $2,500 tapping a few buttons on my iPhone? You see, 7 days ago, we put on a bet that the SPY ((the exchange traded fund – ETF — that tracks the most popular S&P500 stock index ) would stay below $210 when it was priced around $208. Well, today it closed at 201.88. If you want to check for yourself where the SPY is trading at – you can go to finance.yahoo.com and type in SPY in the search bar — or better yet on your iPhone device, download the investing.com app once you have it downloaded — at the top right search bar –type in SPY – which represents the S&P500 ETF — and you’ll see a chart. Then rotate your phone to see it in landscape full screen mode. Make sure you have candles selected — because that’s the best way to view a chart — that’s how we display all of our charts on our blog. So you should be able to switch between different time frames and also see a live feed of what the SPY is trading at. If it’s during market hours 9:30am-4pm, you’ll see it flashing and changing numbers with each ticket. Otherwise, you’ll just see a static chart. So what happened Last Friday? Last Friday, SPY – was reaching up into the 209.5 to 210 zone after dropping to as low as 205 the day before. 1) based strictly on mathematical probability, the SPY had a roughly 55% probability of staying below 210. When it was trading at 209.5 — we said OK — even though there’s a 55% mathematical probability of staying below 210 at this point, we believe — with our wave pattern analysis, that instead of 55% — it’s actually an 85% chance that SPY will close below 210 by next Friday — meaning by today December 11, 2015. Well, it turns out we were right and the risk reward ratio for this bet or trade was a 3:1 risk reward. So we put up $7,500 in order to place an 80% probability bet to win $2500. If you think about that, that’s a return of 33% in just 1 week for an 80% chance that it will stay below the 210 level. That $7,500 essentially became $10,000 as a result of this bet. Now let’s talk a little bit more about the probabilities. We mentioned that we believed there to be an 80% probability that the SPY would close 1 week later–which is today below the 210 level. Well, it turns out as part of this bet, in addition to choosing the 210 level, we also choose a 2nd level where we want to cap our losses. Remember, this is a defined risk trade — we don’t do unlimited losses here. If you short something and it goes to infinite, you could have unlimited losses – we don’t do that here. We do defined risk trades here. So we picked the 213 level as our max pain. We bet the SPY would close below 210 — and specified the 213 level as our max pain level. That’s our defined risk — between 210ish to 213. If we specified a number even higher than 213 — then the maximum loss would be higher — and the brokerage would require us to put up even more money as collateral. 213 is where we felt comfortable in terms of margin and in terms of potential profit. Well, I would say there’s a 10% chance of SPY ending up between 210 and 210.5 — which is actually our break even point. And then another 10% chance that it ends up between 210.5 and 213, that’s when we lose money. But it’s likely if we crossed the 210.5 point at any given point, we would’ve exited the trade at break even or close to it. We never want SPY to even cross our break even point. That’s why this strategy works so well — we have a breakeven point that’s a little bit higher than the level we bet on — in this case 210 with a break even point of 210.5 and a max pain at 213. Well, ladies and gentleman, today the SPY closed at 201.88– and as a result, we realized our maximum profit of $2500 for this trade — a 33% return on the $7,500 capital we put up for this trade — all in just 1 week from Friday to Friday. So that was a trade we initiated last Friday and realized today. Going into next week, we already have a new bet that we placed on Wednesday– just 2 days ago — a bet that the SPY would stay below 206.5 by next Friday December 18. Like last week’s trade, this trade has a roughly 60% chance of success because at the time, the SPY was trading at 205.5 — so betting that it would stay below 206.5 is mathematically just slightly better than 50/50– but based on our wave analysis —we see it as closer to 75-80% of success. In terms of the trade stats — we have close to a 3:1 risk to reward here. We put up $8,000 for the 80% chance of making $2,580. Well, we still have all of next week, but so far SPY is trading at 201.88 and things look on track. If SPY closes next Friday below 206.5, then we will realize $2,580. If, at any point, the SPY gets towards the 208 or higher zone, we will exit the trade at a loss. But at the moment, we are expecting some downward pressure between now and next Friday December 18, 2015. So there you have it — how we realized $2500 in profits from our trade just 7 days ago — and how we initiated a separate trade expiring next Friday — and as long as SPY stays below 206.5 (it’s currently at 201.88) — then we will realize another $2,580. To learn more about our strategy, visit www.lifestyletrading101.com and subscribe to our daily updates and subscribe to our weekly podcasts where we talk about our real trades and our market perspective. Thanks for listening and tune in next week – we’ll find out how these puts that we just bought yesterday are doing next in next week’s episode. Previous post Bought SPY Dec18 206 puts @2.73 Next post Wow! Up $26,000 in 1 day! I’m going to the Maldives!